Ava is not quite ready for high heels, yet that doesn't stop her from trying them on. Or semi twisting her ankle. Poor girl, I guess it's not too young to realize fashion is painful. (Little kids shoes that have heels? Bugs me so much!!) Trying on Daddy's glasses! We had a nice weekend. On Friday we took the kids to Dawson Creek to ride their bikes. This was perfect, Ava is still getting the hang of it and Colton really inspires her to keep going. He is a little rock star on his bike with NO training wheels!! They rode and rode for at least an hour and a half. Ava would of never went that far, but chasing Colton made it fun! There were even lots of hills but she did it! Where is Colton?? At some point we realized we had lost Norah's shoe, so the Shoe Hunt began! We retraced our steps looking all over the place. We eventually found the shoe, both kids rode right by it, big help they are : ) We saw a nutria: Colton taking a little rest. Goodbye love. On Saturday John & I took the kids to OMSI. It took us approximately 42 years to find a parking spot. It was REALLY crowded, we were over it pretty quickly. But the kids loved it! I think I am going to have Ava start sending letters to people just to see if they write back and make her day! Thanks again Matt & Rhi, I can't tell you how cute and sweet I think it is that you would see something Ava would love and send it to her. That's pretty awesome!! Ava is a little weird, I'm not going to lie. I can't get over how grown up Norah seems all of a sudden. Her hair is really filling out and getting curly, it's so cute! Norah is still just taking a few steps at a time and falling. Being sick set her back, she had no balance for several days but you can tell she is about to really catch on. Nearly every day we drive by The Springs, where Grandpa used to live. Ava always points it out to me, "Look Mom!! That's The Springs! Where Grandpa used to live!!" Then she gets quiet, "But he died. But we can still go there and visit the other old people, Linda is going to take me back there some day..."
For eight months I have had that same conversation, over and over. So yesterday Linda was coming for a visit & we decided that this should be The Day. "Ava, Linda is coming over today, we are going to go to The Springs and have lunch"
She looks at me like I have completely lost my mind. "Mom, I'm so sorry, you can't go with us." I love shopping, AKA leaving the house. I figured I would write about shopping since I am missing leaving the house, ever. Well that's a lie, we did go to Ava's swimming class and Norah's "well check up" which holds a bit of irony since she really isn't well. Look at what a relaxing place Costco is!! They even provide lots of appetizers. They do however need to work on their beverages, I don't think they have ever offered me a margarita or wine or anything fun like that EVER!! Doesn't she look like she needs a drink with a straw & an umbrella? 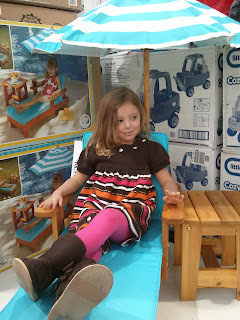 So anyhow, last week when we were at Costco, Ava came across this GINORMOUS moose and of course, she wanted it, badly. Our little Norah is starting to come back to us. She isn't all smiles yet, but she was far happier today. I was even able to capture a few funny pictures of her cutest moments. She was playing with this shape sorter box, so naturally the next step would be IN right? She thinks so. Look at that face. I couldn't love her more. Norah is at a funny stage right now, she must have at least one hand on me at all times. She may crawl away for 2 seconds but she will inevitably come right back and put her little hand on my knee or wrap her arms around my legs. Mostly she wants to be held and I will take it because I know from past experience that these stages are fleeting. Not that Ava doesn't want to be held or crawl all over me every single day, but it's a whole different kind of attachment then this baby needs to be near momma thing.